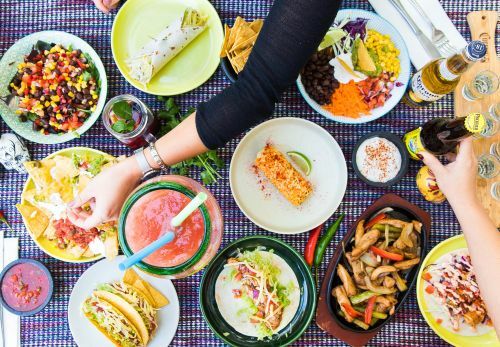 Taco Bill Chadstone uses their own specialised couriers to deliver their food. Prawns and scallops with onion, lettuce, salsa fresca and cheese. Beer battered fish, pico de gallo, shredded cabbage, chipotle aioli and a wedge of lime in a warm flour tortilla. Crumbed jalapenos filled with cream cheese. Served with sour cream salsa. Grilled sweetcorn on the cob rolled in chipotle aioli and Parmigiano (GF) (V). Prawns coated in our secret 8 spice crust with chipotle aioli. Cheesy fries covered with our signature chile con carne, house-made guacamole, sour cream and salsa. Sauteed with onion, red and green capsicum. Served with house-made guacamole, lettuce, Mexican rice and flour tortillas. Sauteed seasonal vegetables served with house-made guacamole, lettuce, Mexi rice and flour tortillas. Stack of corn tortillas “New Mexico style”. Topped w / mild chile sauce & an egg. Served w/taco, frijoles & Mexi rice. Half an avocado topped with prawns and scallops in a tangy creamy sauce then baked. Served with frijoles and Mexi rice. Marinated chicken of beef strips, lettuce, cherry tomatoes, capsicum, Spanish onion, fresh avocado tossed w/ balsamic dressing. All your favourite fillings, without the tortilla: shredded lettuce, black beans, Mexi rice, grilled corn, pico de gallo, cabbage, topped with house-made guacamole, yoghurt, jalapenos and lime. Lettuce, tomato, red and green capsicum, avocado and spring onion tossed with balsamic dressing (GF) (V). With homemade caramel sauce and whipped cream. Cream cheese custard flan with sticky caramel sauce.